With the weather warmer and the days longer, it’s no secret that summer is the best. Sometimes the busyness of summer can mean school-related activities fall to the wayside, but this shouldn’t be the case. 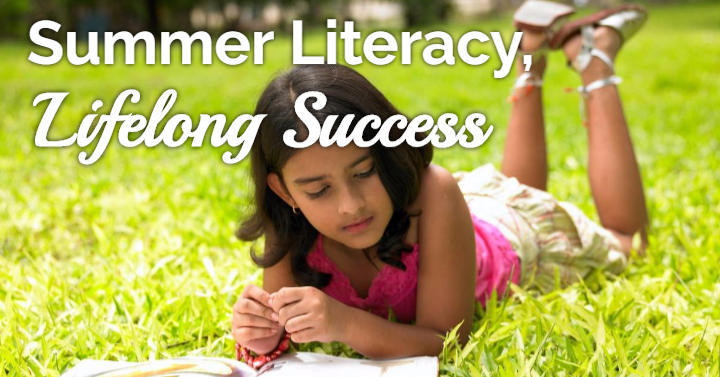 Considering children lose, on average, two months of reading skills over the summer, it is imperative to implement literacy into summer activities. At The Cary School, we believe building on literacy doesn’t have to involve paper and a desk, it can and should be fun! Check out these ideas to help your young one maintain their reading progress all year long. Take a break from the sun with weekly trips to your local library! Most libraries have amazing reading incentive programs for children (and sometimes for adults, too). Kids will love getting to pick out books, not to mention toys from a prize box or some other type of reward. Check your library’s calendar to see when there are fun reading events for your family to enjoy. If your child is well on their way to letter recognition, hide letters around the home and/or yard for them to hunt. Stick with letters they are already familiar with, introducing them with new letters gradually as they are ready. For younger children who might be unfamiliar with letters, this is a great way to get them started! Hide multiples of just one letter (i.e. hiding only the letter “A”) in a manner most age-appropriate for your child. For kids who demonstrate a working knowledge of print awareness, help them start practicing their writing with water painting! Grab paintbrushes and water, and work on painting letters on the sidewalk or the driveway. Be sure to let them explore with painting first before suggesting any specific directions. Tape letters to individual toy cars, then tape the corresponding letters around the room (or home for a further challenge). Have the kids “drive” their car to the right “parking spot”, matching up the letters. For younger kids, start them out with matching based on color, or have pictures and words to match up with (i.e. a picture of an apple with the word “apple” underneath). Everyone will have a blast driving and parking their car around! Create a Bingo scorecard for your kids (regular dimensions are a 5×5 grid, but you might want to make it smaller for younger kids), filling it with letters they are familiar with. Walk around a neighborhood or a city, crossing off letters they see along the way. Once they fill up their scorecard, they win! This is also great to try with numbers instead of letters. As we take the time to enjoy our summer, it is incredibly important to enjoy and practice reading development with our young ones. Literacy development is crucial for a child’s educational growth and success. At The Cary School, we offer the highest quality instruction to help your child’s literacy skills soar. Enroll with us to help your child off to an incredible academic start!